The fifth annual Slovakian JobExpo took place on the 29th & 30th of April 2015, at the Agrokomplex in Nitra. 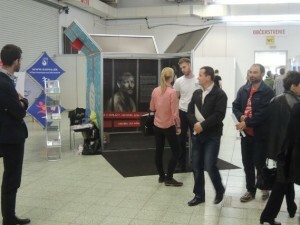 Around 140 exhibitors presented at the jobs fair and offered work to visitors. 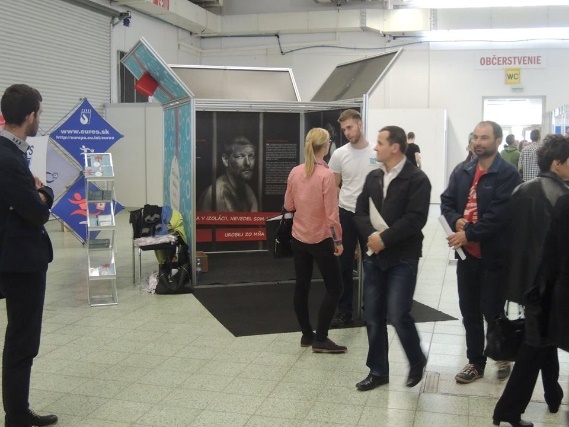 This is the second year that the Slovak Catholic Charity participated and used the Expo as an awareness-raising opportunity using its Gift Box Campaign – People are not for sale. 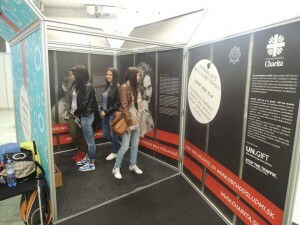 Since exploitation and forced labour are some of the aspects of human trafficking, the job fair is a good opportunity to draw the attention of visitors to this dangerous phenomenon, in the belief that awareness raising is critically important as a preventative measure. The Fair was attended by representatives of the Ministry of Interior, who provide lectures for the general public, on the issue of trafficking as well as informative lectures for high school students. 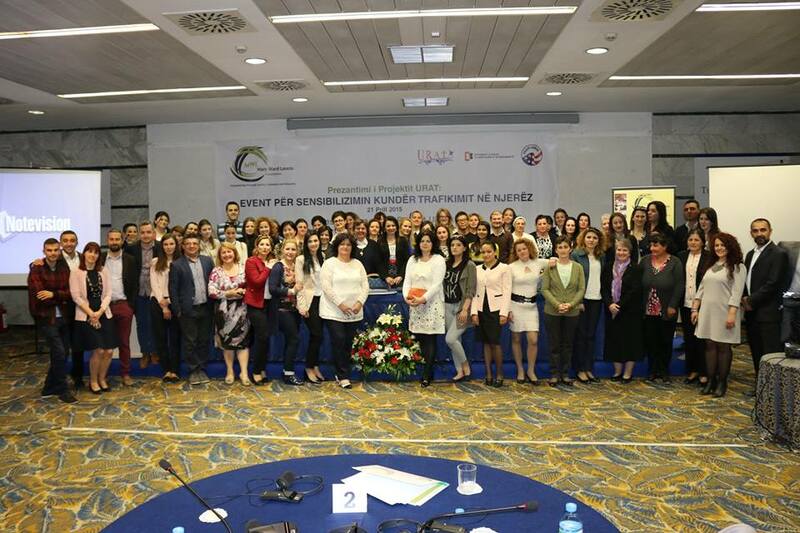 Since 2014, the New Project URAT in Albania, has led more than forty awareness-raising training seminars on human trafficking. Managed and funded by the NGO Mary Ward Loreto in Albania, the project is a collaboration with several other organisations present in Albania, e.g. the Peace Corps, the NGO Different and Equal, the IRCA (Institute of Romani Culture in Albania) and De Nobi Te Gruas Shqiptare. 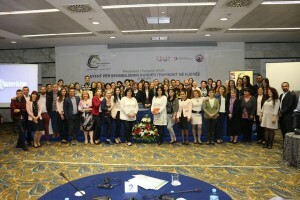 The project focused primarily on those who are socially and economically marginalised, the most vulnerable in Albania, who need protection against different forms of exploitation, including human trafficking. MWL/URAT (Mary Ward Loreto/ United Religious Against Trafficking) have compiled a report on their anti-Human Trafficking training initiatives in Albania, up to July 2014 last. URAT is an Albanian word which means “bridges” and is an appropriate abbreviation for work which helps to build bridges of understanding and knowledge within the various communities. So far this year, Mary Ward Loreto and URAT have conducted almost thirty Human Trafficking awareness training seminars with schools and municipalities throughout Albania. Engaging Peace Corps Albania and the NGO “Different and Equal” (works to support women who have been victims of trafficking ), Mary Ward Loreto and URAT have done enormous work in drawing materials together in order that training seminars are both informative and empowering of people, so that they can act to prevent and stop human trafficking. On Wednesday, 4th June 2014 two workers of Caritas Slovakia who are also members of RENATE Network, gave a comprehensive interview about human trafficking on LUX Television, Slovak Catholic TV Channel. Anna Bartošová and Sr. Bohdana Bezáková CJ explained potential risks connected with very attractive job offers from abroad and informed what precautions to take to avoid the danger of human trafficking. “More than 1,000 individual events combine to make the German Katholikentag a place of bridge-building; on behalf of society, faith and community. Being a Christian means dedicating oneself out of faith in God and Church and Society. Every Katholikentag is a platform for political, social and Church dialogue…”(Bridges of Encounter and Change; Katholikentag 2014). The above quotation set the expectations for the Katholikentag of 2014. The founders set the bar to a high standard , which was lived up-to throughout the five days of the event. At Katholikentag RENATE walked, worked and prayed in a place in which faith was enabled, encouraged, modelled, facilitated and taught. Hundreds upon hundreds of stalls and bright white tents were decked out colourfully and plentifully, welcoming and inviting us in, to engage, discuss, share and learn, affording us first-hand and memorable experiences of the diversity of life in Catholicism and in the contemporary Church. Develop awareness-raising activities against human trafficking and the growing demand within all levels of society in Europe, using all forms of modern technology and communications. Network, share resources, skills and knowledge. Research and implement actions against the growing demand for such abuse in the countries of origin and destination. At Katholikentag, we came to learn and to share the work of RENATE and to involve more people in this work against the trafficking in human persons. We shook hands with hundreds of people from all sections of the church, shared meals with complete strangers who soon became friends and talked for hours with those equally passionate about Catholic Social Teaching and the journey of faith we are on, young and old alike; a journey of building bridges between God and humankind. The intensity of such dialogue took us to places where we would rather not go; presented us with challenges and inevitably demanded that we give without limit as Christ himself gave for us. Despite the incessant rain, we enjoyed the varied programmes of religious music, new music, pop, exhibitions, tours, cabarets, readings and Liturgies – Catholic, Protestant, Orthodox and Ecumenical. We braved the rain and joined the thousands celebrating Mass at the University Stadium to commemorate Ascension Thursday. It was a fitting prelude to the presentations and workshops held that afternoon, with our own RENATE-Europe presentation staged from 14.00 to 15.30. The very attentive audience present clearly appreciated that very careful and thorough research had been done in order that a seamless presentation was achieved. The topic was Human Trafficking in Europe and from the Opening Address presented by the RENATE President, Sr. Imelda Poole, IBVM, through to the contribution of various other members of RENATE, there was a clarity of message and content maintained throughout the proceedings. Sr. Dagmar Plum MMM, the RENATE member from Germany, chaired the proceedings and gave input on her work with the Jesuit refugee service in Berlin, alongside other members who shared their local story of work in this field. It both challenged and invited those present, to think about what the presentation said to them as a group of audience members and invited their consideration and agency, in working as a network…the potential and the power of possibility. We were blessed to have been joined by a five-person, male Acapella, who complimented the presenters with their selections of contemporary music and lyrics, ranging from Cold Play’s “Paradise” through to Leonard Cohen’s “Halleluiah” which concluded the proceedings. It also probably reflected the sheer relief of all five presenters to have completed that afternoon’s work! They did a magnificent job, sensitively speaking about the work of anti-trafficking across Europe and all the while, placing at the centre, the care of the victims. Jesus revealed much about the reign of God through the Parables that He told. Amongst the most important are those that speak of extending the hand of friendship to others in need. The most obvious one that comes to mind, is the parable of The Good Samaritan. The ministry of RENATE-Europe is to be The Good Samaritan. Others have, and will continue to turn a blind eye and walk away from the challenges of Human Trafficking and the exploitation of one’s fellow human being, but RENATE is steadily sowing the seeds of a courageous stance, to work against Human Trafficking in Europe and maintain the dignity of the human person. Imagination is the eye of the soul, according to Joseph Joubert and one of the great human realities is that we have the capacity for rich imaginings. It is a powerful source, which is often harnessed for good, but also often harnessed for less laudable purposes. Katholikentag provided us with a rich opportunity for networking and the opportunity to create new relationships, shared learnings and shared language codes with which to articulate our ministry. Written by Anne Kelleher, Communications Person (pending formalisation of appointment). RENATE Members will be present at the National Assembly of Catholics (Katholikentag) in Regensburg, Germany, 28th May – 1st June 2014. More news coming soon.